you are one of the millions of pet parents searching for a nutritious, yet tempting, food for your dog, we’ve got a treat for you today! As more people recognize the importance of healthy eating for themselves, the health of our pets through nutrition has also become a priority. Since we have become a more educated group of consumers about what goes into our beloved dog’s meals, we insist pet food makers produce diets exceeding our expectations. We believe Farmina Pet Foods is a company that understands this mission and creates outstanding products to help ensure good health for our furry family members. Keep reading for reviews of two of their dog foods which we feel might be very good choice for any breed. Beginning in 1965, what would eventually become Farmina Pet Foods started out as a family business manufacturing animal nutrition for livestock. Being an Italian business, family was at the core of the venture and the next generation worked up through the ranks to eventually take over. In 1999, a son of the founder believed the new direction of the company should focus on scientifically formulated pet nutrition, and Farmina Pet Foods was born. In 2013, the company began selling their food in the U.S. market. Their foods meet the high-quality standards of the European Union and are AAFCO approved for U.S. consumers. Farmina Pet Foods offers diets which are GMO-free, do not contain steroids, are free of growth hormones, and are made with organic products. The company is also dedicated to cruelty-free research of all their pet diets. Additionally, the foods are preserved using only natural antioxidants. The pet nutrition Farmina produces have low glycemic index. The company states this is important because pets’ metabolism has evolved to gain energy from animal proteins and fats, not carbohydrates. As a way to ensure the freshest food possible reaches the consumer, Farmina introduced a packaging system incorporating nitrogen, a naturally occurring gas, into each bag of pet food. The nitrogen displaces the already present oxygen in the packaging, which might cause spoilage over time. This is standard in the human food industry, but a novelty for pet food companies. Farmina Pet Foods has had no recalls of their pet foods in the United States. Information on recall status in Europe was not available. The Farmina company believes that much of the anatomy of our domesticated dogs remains true to their carnivorous wild ancestors. Our dogs have sharp teeth for ripping flesh; they possess short and simple intestinal tracts for digesting proteins and fats; and, they lack certain salivary enzymes for breaking down carbohydrates. 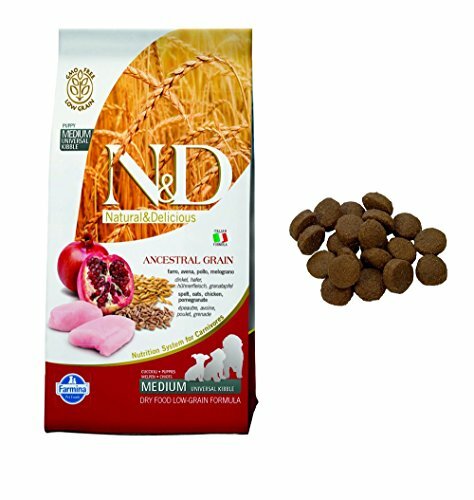 The dog’s ancestral diet consisted mainly of animal meat and Farmina’s N&D Grain-Free formula reflects this with 70% animal protein included, satisfying this intrinsic nutritional need. Most dog food companies use legumes to increase their protein content, but a look at the Farmina ingredient label proves they do not. To further comply with the high protein, low carb, and low fiber diet of this formula, 30% of the food’s ingredients are fruits, vegetables, vitamins, and minerals. The company states that the animal protein content in the N&D Grain-Free Chicken formula is 95%, with no bone, which is much higher than other premium dog foods. Again, the ingredient label of the N&D Grain-Free Chicken formula bears out this claim, listing several animal acquired products first. Deboned chicken, dehydrated chicken, chicken fat, dehydrated egg product, herring, dehydrated herring, herring and salmon oil blend — all within the first nine ingredients. Since products within a food are listed on the label by weight from most to least, you can see your pup is getting solid nutritional benefit from this food. The chicken used in Farmina foods is sourced from Italian free-range farms where they are fed a GMO-free diet. The herring is wild caught and the eggs are sourced from Italy and transported fresh to the shelling plants. The company believes this ensures the preservation of nutrients in the dehydration process. The ingredient label lists no poultry byproducts and the company says it uses “…only high-quality animal parts [to] ensure our food has a high biological value and a 95% digestibility rate.” This food is gluten-free and uses no added plant oils of any kind. It is a complete food suitable for all ages. 37% Protein, 18% Fat content. GMO-free ingredients suitable for human consumption. No corn, soy, or added plant oil products. Carefully sourced ingredients from growers of human foods. Chelated minerals and amino acid compounds (taurine for heart health and L-carnitine to turn fat into muscle). The inclusion of pre- and probiotics for healthy digestion. As with the grain-free formula, the N&D Chicken Low Ancestral Grain Puppy Formula is made with the dog as carnivore in mind. High levels of animal ingredients are also present in this food at 60%, with 20% as grains, and 20% as fruits, vegetables, and minerals. Legumes and other plants as protein are not used in this formula, either. This food contains 93% protein from animal sources. The ancient grains used in this diet are organic whole spelt and organic whole oats. Spelt is a very old grain, the experts at Spelt Bakers say as old as 9,000 years. It rates high in bioavailability and is a powerhouse in health giving properties. It is highly digestible and stimulates the immune system. Whole oats are an excellent source of protein, fiber, vitamins and minerals, and antioxidants. These grains are also sources of readily available energy, something any growing puppy finds essential. 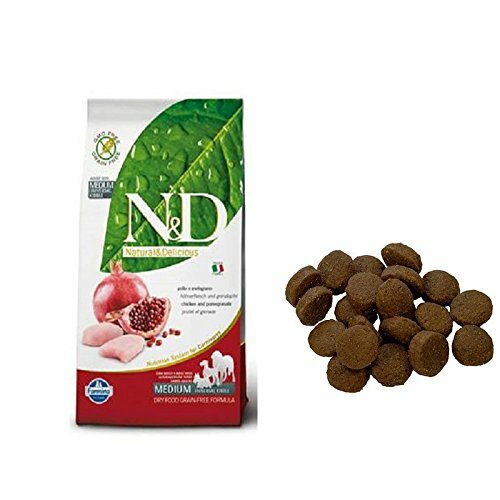 This N&D Puppy Formula is appropriate for little ones in part because of the close attention Farmina has given to the calcium-to-phosphorus ratio. Growing puppies must have a precise balance of nutrients in their diet in order to grow at a healthy rate for optimal skeletal development. Damage caused in the early stages of growth cannot be repaired later. Care must be given to provide a restricted caloric intake in the first year of a puppy’s life. 35% protein, 20% fat content. Gluten-free and no meat by-products. High in antioxidants (blueberries, green tree extract, rosemary extract) to support a strong immune system. Probiotics to help develop and maintain a healthy digestive tract. Salmon and herring oils, natural sources of DHA (Docosahexaenoic acid) to support cognitive development. Omega-3 fatty acids for maintaining healthy skin and coat. Glucosamine and chondroitin for healthy joints. No artificial preservatives, colors, flavors. No corn, soy; no added plant oil products. The Farmina dog foods are impressive, although the price will place it out of reach of some pet parents. It is a very high-quality product. The grain-free formula is more expensive than the 20% ancestral grain food, so this could provide a way for more consumers to try the brand for their dog. We believe this company’s product would provide lasting health benefits for your beloved pet. Carol Cornwall has loved animals from the time of her first childhood pet, a duck named Fluff. From then, it’s been a steady parade of dogs, cats, rabbits, chickens, horses, cows, goats, and sheep. In addition to writing, she’s worked as a vet tech, cow hand, and owned a dog boarding facility. She now shares her home with three very spoiled dogs. I see that this food contains pea starch. Is pea starch a concern for fertility? As a show breeder I am very concerned about this. I’ve heard that peas contain an estrogen like chemical effect. Thanks for connecting to Mysweetpuppy.net. Please keep in mind that I, Claudia Bensimoun, do not write any of the blogs or reviews on this website, nor have I in the past. I only answer the comments section.The phytoestrogen level in peas is insignificant compared to soybeans. Many breeders have expressed concern as to whether peas in dog food affect fertility. Pea starch is highly digestible, and is also a valued source of energy.That said, if there is a high-placement of this ingredient on the ingredient list, this will indicate concentrated levels. Today, many pet parents prefer to opt for dog food without any pea protein or peas.It is also important to read the ingredient list very carefully, and to make sure that the peas or pea protein does not replace meat protein in your dog food. Hope that helps! Hi! I’ve also found most of N&D codes impressive after reading their ingredients and numbers but how can we be sure about the quality of the raw materials the company use? For example, you say that they use chicken “sourced from their Italian free-range farms where they are fed a GMO-free diet”. But Famina is producing pet foods in 3 factories, located at Italy, Serbia & Brazil. I could trust the Italian factory but what about Serbia (a European country outside E.U.) and especially Brazil (where GMO foods are the rule)? Thanks for connecting to Mysweetpuppy.net. Please keep in mind that I, Claudia Bensimoun, do not write any of the blogs or reviews on this website, nor have I in the past. I only answer the comments section.Great question!The dog food must be made by a reputable and knowledgeable dog food company that has the highest quality control measures. In your case it’s best to contact the manufacturer directly and submit your questions. New puppy and dog food formulas need to be switched over slowly. With pups it’s always best to keep feeding the same puppy food as the breeder was feeding.During the first 6-8 weeks your puppy should be feeding off his mother’s milk.This will give him the nutrients he needs to fight off diseases until he gets vaccinated. At around 6 weeks, he should have a combination of puppy food and milk replacer a few times a day. It is during this stage that one starts weaning him from his mother. The weaning process will take up to 3 weeks. When choosing a puppy formula it’s best to consult with your veterinarian for the best advice. Because puppies are growing, they need more protein, micronutrients, and carbs. Puppies have high caloric needs, and they should consume a high-quality and well-balanced diet throughout their lifetime. It’s always best to look for a high-quality puppy food with small kibbles because your pup’s mouth is going to be small. All puppy dog foods will have a puppy feeding chart on the package. It is important to follow this chart, so that you understand how much food to feed your puppy. Each puppy dog breed will be different.You should feed your puppy at the same times three to four times a day. Thnaks again for connecting! Keep in touch! I have my 3 mth pup on the adult formula or all stage formula as it was suggested any puppy formula is just too high in protein. She loves it and gobbles it down. The feeding amounts are on the bottom of the bag. I truly hope this food is as good as you say it is. There are so many food full of filler and that have had recalls. I just want the best for her. Thanks for connecting to Mysweetpuppy.net. Please keep in mind that I, Claudia Bensimoun, do not write any of the blogs or reviews on this website, nor have I in the past. I only answer the comments section. All pups need to be on a puppy dog food that is appropriate for their breed. Please consult with your veterinarian for nutritional advice. Hi, I feed my 2.5 months beagle puppy 3 times a day with Farmina Vet life growth. The puppy is 5 kgs and seems to be hungry even after 140 grams of farmina product in a day. He is a very active puppy. Please help..is this the right amount of food i am serving him. Please consult with your veterinarian as to the best puppy food for your 2.5 month old puppy. Your veterinarian will advise you on how many times a day your puppy needs to eat, and about the starter foods that pups should begin with. Most importantly, never feed your puppy an adult dog food. Just started trying your dob food. My sheltie has a sensitive stomach so I am always looking for quality dog food that is easy to digest. The Martins’s pet store recommended your brand to me. I tried 3 of your samples.cod,lamb and chicken. My sheltie liked them and could tolerate them. Thank you for making a high quality dog food. Thanks for connecting to Mysweetpuppy.net. Please keep in mind that I, Claudia Bensimoun, do not write any of the blogs or reviews on this website, nor have I in the past. I only answer the comments section.Farmina may be a great, high-quality dog food brand. Farmina works together with Farmina Vet Research.This company includes a team of veterinarians and nutritional formulation specialists.Every dog is different, with some suffering from serious allergies, while others will have digestive issues or other ailments. It’s always best to consult with your veterinarian as to the best dog food option for your dogs, most especially when dealing with multiple issues like itchy skin, sensitive stomach, and ear infections. All cereals in Farmina have been substituted with animal proteins. In this dog food formula, you’ll get 70% animal ingredients and 30% veggies, fruits, vitamins, and minerals. If I have a dog with itchy skin, ear infections and with a sensitive stomach which grain free food for you recommend? I also noticed that the bags do not state that the food is organic, non GMO and approved ingredients for human consumption. Has that changed? I really want to switch to your food. Thank you! Thanks for connecting to Mysweetpuppy.net. Please keep in mind that I, Claudia Bensimoun, do not write any of the blogs or reviews on this website, nor have I in the past. I only answer the comments section.Farmina works together with Farmina Vet Research.This company includes a team of veterinarians and nutritional formulation specialists.Every dog is different, with some suffering from serious allergies, while others will have digestive issues or other ailments. It’s always best to consult with your veterinarian as to the best dog food option for your dogs, most especially when dealing with multiple issues like itchy skin, sensitive stomach, and ear infections. All cereals in Farmina have been substituted with animal proteins. In this dog food formula, you’ll get 70% animal ingredients and 30% veggies, fruits, vitamins, and minerals. At the top of each bag, there should be a GMO-free logo, and a grain-free one too. Farmina has an awesome website which details how to find the right dog food for your dog. Also, please check out the FDA link about potential heart disease in dogs fed with grain-free dog food. Hope this helps. Thanks for connecting to Mysweetpuppy.net. Please keep in mind that I, Claudia Bensimoun, do not write any of the blogs or reviews on this website, nor have I in the past. I only answer the comments section.Please consult with your veterinarian as to the best puppy food for your 8 week old puppy. Your veterinarian will advise you on how many times a day your puppy needs to eat, and about the starter foods that pups should begin with. Most importantly, never feed your German Shepherd puppy an adult dog food. My Havanese is very fickle about food. I leave his food out because sometimes he likes to eat late at night (no he started this before I started feeding him this Italian food so no he has not had the time to pick up the culture!) or pick in the am. Some of this my have to do with my early upbringing of giving him a treat after goigoing to the.bathroom. So. Is there any harm leaving his food out overnight and is so what is the longest period of time to leave it? My VET says he has alligeries to red meat and grain (I question this) but he is very happy and healthy so I don’t want to change what’s not broken. He was on Fro.m. salmon but became disinterested with it hence the change. He is still Transitioning transitioning to Farmina he seems to like it even picking it singularly out of his bowl. Thanks for connecting to Mysweetpuppy.net. Please keep in mind that I, Claudia Bensimoun, do not write any of the blogs or reviews on this website, nor have I in the past. I only answer the comments section.Both Fromm and Farmina are high-quality dog foods. Farmina is great because all cereals have been substituted for animal proteins.Farmina also contains 70% animal ingredients,and 30% vegetables. That said,there is no best diet, since all dogs have different dietary needs, so it’s always smart to find the best dog food to match each individual dog. Good to hear the transition is going well!